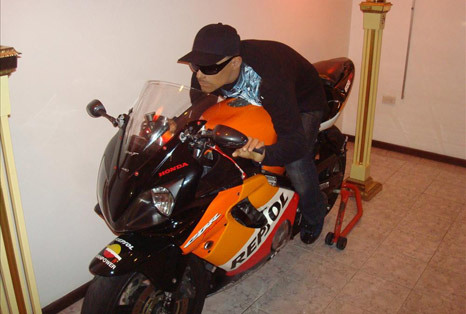 Morticians at a Puerto Rican funeral home chose to display the body of David Morales Colón on his Honda motorcycle rather than in a traditional casket, as shown in the photo above. Colón, 22, was murdered last Thursday in his San Juan neighborhood, Primera Hora reports (Spanish). For his wake, the Marin Funeral Home dressed the young man in his typical riding clothes, helmet included, on top of his beloved motorcycle.